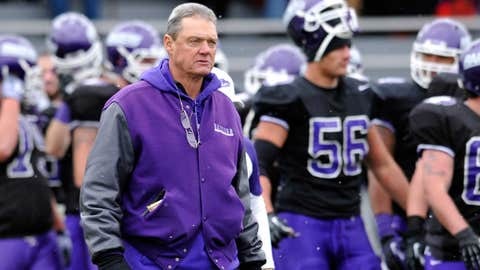 Mount Union head coach Larry Kehres took over last May for his father, Larry, who in 27 years as head coach won 332 games and lost 24. There are a couple of problems with thinking of the Div. III national champion as a big fish in small pond. Chief among them: It’s selling the dominant football programs at Mount Union and Wisconsin-Whitewater a little short; both have almost outgrown the pond. At very least, they’ve basically cleaned it out, dyed it purple (a primary color of both schools) and turned it into a member’s only type of joint. When 14-0 Mount Union and 14-0 Wisconsin-Whitewater meet on Friday night in Salem, Va., in the Stagg Bowl, the Div. III national championship game, it will be their eighth meeting in the last nine seasons. All in Salem; all for the trophy. Wisconsin-Whitewater took last year off, missing the playoffs at 7-3; Mount Union beat St. Thomas (Minn.) to win its 11th national title. Wisconsin-Whitewater had won the previous four, part of a 46-game win streak. Mount Union had won the previous three, and in losing that 2011 game it not only fell behind in the head-to-head series but saw Whitewater flirt with breaking its record streaks. From 1996-99, Mount Union won 54 straight games. 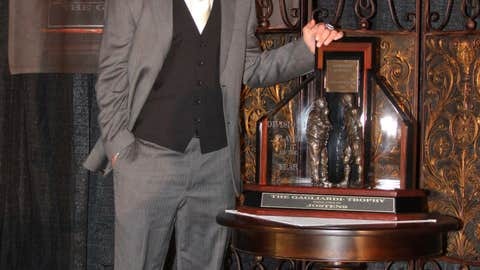 Starting the following year and going to 2003, it won 55 in a row. Coming into Friday night, Mount Union has won 29 straight games. With six sophomores starting on defense and quarterback Kevin Burke just having won Div. III Player of the Year honors as a junior, you don’t need to be a math major to see how streak talk might soon come back into play. Except that Whitewater stands in the way Friday night, like it has before. And of the 100 players on Whitewater’s regular-season roster, 47 were freshmen. Warhawks quarterback Matt Behrendt is a junior, too. His top target is a junior. Whitewater’s top running back is a sophomore. This week, new Mount Union coach Vince Kehres said that any mention of the past in the buildup to the game would come only from storytelling or the building of story lines. "We have very few guys who played significant roles (in 2011)," Kehres said. "They have new people, too. The only comparison we’re making is that Whitewater has a really good football team and has been good enough to beat us for a while." Speaking of new roles, it’s not exactly accurate to call Kehres a new coach. He’s in a new role as the head coach, but Mount Union football has been his life. He took over last May for his father, Larry, who in 27 years as head coach won 332 games and lost 24. Vince very literally grew up with this. "I found out this week from my wife that I’ve really been married for 14 years," Vince said. "She told me that she never plans for it, but in 13 of them we’ve been to the Stagg Bowl." Perhaps she should start planning. Both coaches insist they didn’t plan for this, or for one another. Kehres said he thinks Mount Union was voted preseason No. 1 "because of last year, because of the past. We had one starter back on offense, (four) on defense. I’m proud of the way these kids have grown and fought and just refused to be denied." Mount Union won its quarterfinal, 62-59, over Wesley, and beat North Central (Ill.) last week, 41-40, in a blizzard, twice rallying to score go-ahead touchdowns in the final five minutes. Whitewater beat Linfield (Ore.), 28-17 in the quarterfinals — Linfield had been averaging 50 points per game — and went on the road to beat Mary Hardin-Baylor, 16-15, last week. As a reminder that this still is Div. III, Wisconsin-Whitewater coach Lance Leipold said last week’s trip to Texas marked the first time a handful of his players had ever been on an airplane. Planning this flight to Salem was a more familiar trip. Ditto for Mount Union, which buses through the mountains of West Virginia and Virginia to get to Salem, always pulling over for lunch at the same travel center. "The food is only bad when you lose," Kehres said. Said Leipold: "Both teams have won a lot of games to earn their way here. This is not a given." Because Leipold is 93-6 as the Warhawks head coach, it just seems that way. Last year’s win saved that group of Mount Union seniors from becoming the first class in 16 years to leave without at least one title. Mount Union is playing in the Stagg Bowl for the 17th time since 1993 and is 271-11 since that ’93 season. Two hundred seventy-one. And 11. Four of those 11 losses have come to Whitewater. The next one on Friday night should, again, be good. Winner gets keys to the pond.